Berg seem fishier and fishier. A large number of anomalies surround the life and death of Nicholas Berg. A Jewish man, 26 years of age and a U.S. Citizen, he traveled alone in Iraq. Family and friends described Berg as an adventurer, high spirited and intelligent. A Washington Post report notes, "Berg was a weight lifting enthusiast and amateur comedian who had traveled abroad to help people improve their lives. Among his trips was a visit to the West African country of Ghana, where he taught villagers to make bricks and returned emaciated because he gave away most of his food." Berg visited Iraq from December, 2003, to January, 2004, and then again starting March 14, 2004. Berg was purportedly looking for electrical contracting work building radio towers. He could not find work, though there was reportedly plenty. On March 24, Iraqi officials arrested Berg at a checkpoint in Mosul and jailed him, because of his Jewish last name and the Israeli stamp in his passport. (See Washington Post report - reg req'd - or CSM Terrorism & Security update for May 13, which excerpts stories about Berg from various media.) Berg told friends in Baghdad that the Israelis thought he might be a spy. (See Telegraph article, "Beheaded American was arrested as a spy because of his Jewish name.") On April 05, 2004, the Bergs filed suit in federal court in Philadelphia, contending that their son was being held illegally by the U.S. military in Iraq. The next day, April 6, Nick Berg was released. On Saturday, May 8, Berg's body was found outside of Baghdad on a highway overpass. On May 11, 2004, a video of Nick Berg's execution, seemingly by beheading, was posted on the Muntada al-Ansar website, which is now offline. There are conflicting reports about Berg's whereabouts in Iraq. According to an email to the Berg family from Beth A. Payne, a U.S. consular officer in Iraq, the U.S. military were holding Berg. This was apparently for 13 days. Iraqi police denied holding Berg. In contrast, the Telegraph article above notes, "Dan Senor, spokesman for the US-led coalition in Iraq, insisted Mr. Berg was arrested and held by Iraqi police." The timeline of Berg's captivity and the timing of the release of the video are suspicious. If Payne was correct, why did the U.S. military hold Nick Berg for two weeks? Why did the U.S. military deny this? The video of the killing has many flaws including problems with time skips, audio dubbing, and the characteristics, appearance and speech of Berg and the killers. People from Middle Eastern cultures believe that Middle Eastern people were not involved in this video, based on the mannerisms, accents, behavior and appearance of the killers. A close inspection of the video suggests that Westerners may have been involved. For a number of reasons, it does not appear that the Jordanian terrorist Abu Masab Al-Zaraqawi, who was voice identified by the CIA (and whose name was on the tape), was involved. He has a poorly functioning prosthetic leg and a hand tattoo, which should have been observed. Neither were. The accent of the speaker in the video was not Jordanian. Why has the CIA seemingly lied about the analysis of Al-Zarqawi's voice and his role in the killing? Considering the many discrepancies and contradictions noted below, it seems possible that the Berg killing is a poorly crafted psy-ops exercise. This video was possibly constructed by U.S. operatives to impact the extremely volatile political developments in the U.S. and the international condemnation around the Abu Ghraib torture photos. The torture photos are mentioned in the speech in the video, though Berg may have been killed before the photos were circulated. The majority of the points below are summarized and excerpted from eight summary articles that culled points from news articles and blog posts. (See links at end.) I compared, combined and edited the various points. Further, I added more points based on my viewing of the video (see Wizbang! Blog: Berg video site list) and by reviewing various news articles. I also added a few points based on comments at kuro5hin.org. Some of the points below are compelling. Some are weak or may turn out to be insignificant or coincidental. This is a work in progress, an early overview of discrepancies. There are too many discrepancies and contradictions to dismiss doubts about the video and the official U.S. stories about Berg. Additional inquiry and fact checking are needed as the Berg story unfolds or, rather, unravels. 1) A Jewish man and U.S. citizen traveling alone in Iraq? Why did a private Jewish American citizen choose to wander around Iraq by himself? He also had a passport stamp from Israel - very unsafe to travel with. In his last email on April 6 to his family, Berg stated he wished to return home as soon as possible. The FBI claim he refused an offer of help to get home (perhaps because of danger to get to airport). The FBI made three visits to the Berg while he was in custody in Iraq. This suggest U.S. authorities were concerned about more than Berg's well-being. They may have had their own suspicions about what the young American was doing in Iraq. 4) FreeRepublic website listed the Berg business as an "Enemy of the State". Nick Berg's father, Michael Berg, signed an anti-war petition online and included the business name. (Note that Nick Berg himself was pro-Bush and pro-war.) This occurred a week before his son's second departure to Iraq. As a result of this statement the Berg business was put on a right wing enemies list. The FreeRepublic website listed the Berg business as an "Enemy of the State." This may have been linked to the thre visits by the FBI during Nick Berg's containment by the Iraqi Police and then presumably by (or under supervision) of the US Military. On 5 April, Berg's family filed a suit in federal court in Philadelphia - contending that their son was being held illegally by the US military in Iraq. The next day he was released and left to get himself home. The US military has stated that Berg was never in US custody and that he had been in custody of the Iraqi police. The Iraqi police adamantly deny he was ever in their custody. (See again: The Unanswered Questions of Nick Berg's Murder.) If this is so, we have to conclude that either the email from Ms. Payne was incorrect or that the US military has been lying. 9) Was Berg at hotel several days to April 10? Staff at Al-Fanar Hotel in Baghdad apparently told The Associated Press that Berg stayed there for several days until April 10. A U.S. consul contract worker checked at the hotel on 4/14 and staff there did not remember Berg. The last time the family heard from Nick Berg was on 9 April. He had planned to return home at the end of March. His headless body was found near Mosul on 8 May. "That's really what cost my son his life, the fact that the United States government saw fit to keep him in custody for 13 days without any of his due process or civil rights," Michael Berg said. 11) Berg is killed before torture photos released but video tape refers to photos? "me and a friend were discussing recent news events and trying to piece together the information presented to us, thought you might want to look into this further, they said in the news that Nicholas Berg was killed 2 weeks ago (i think), however in the video the culprits who killed him said they were "avenging iraqi prisoner abuse" but those photos weren't released until last week, so my question is how is that even a possible motive if he was killed prior to the abuse photos being released?? maybe i am misinformed but thought id ask the question to someone who would look into it." 12) Text with video mentions "shameful pictures"
The text posted to the website along with the video the translation of the Arabic statement, cites "shameful pictures." Here is a translation of the Arabic statement (at the Northeast Intelligence Network) made with the video: "And the shameful pictures and the news of the evil humiliation of the Islam people men and women in Ghareb 's father prison then where the jealousy and where the zeal and where the anger about the Allah's religion and where the jealousy for the Muslims sanctities and where the revenge for the honors of Muslims and Muslims is in the crosses prisons." There is extremely convenient 'wag the dog' timing at the height of furor regarding U.S. torture of Iraqis. CNN poll question: 'Is the Berg killing a reason for withholding any remaining Iraq prisoner abuse pictures?' Bush has been reported to be struggling with question of whether the Pentagon should release additional torture photos. Given that the alleged decapitation of Berg was allegedly prompted by the first wave of torture photos, Bush could now cite 'national security' issues for withholding additional materials. Berg shown in video wearing orange jumpsuit known to be of U.S. issue. The orange jump suit "appears" to be identical to the jumpsuits used at Guantanamo. (Compare with pictures at Guantanamo.) The orange jumpsuit was standard US military issue to men in custody. It is unlikely Berg would continue wearing a U.S. custodial uniform if he had been released by the military as they claim. The fact he was still wearing the suit is both anomalous and suggestive. One wonders: Was there an immediate transfer of Berg from the US military to unknown persons, preventing Berg from discarding his US prison garb? When Berg is decapitated, there was almost no blood. If Berg were still alive at this point, with the cut starting at front of throat, blood would have been spraying everywhere. Berg's severed head, the floor, Berg's clothes, and even the hand of the 'Arab' who decapitated Berg had no visible blood on it. When the executioner holds up Berg's head immediately following what is represented as an actual decapitation of a living person, there is no significant blood flow from the neck or blood splatters showing anywhere on the executioner. Berg seems limp just before the beheading. It is not clear if he was moving after the time skip in the tape. While on the ground, Berg's body didn't seem move except in response to the captors movements. Although held down, Berg would have tried to instinctively wiggle and writhe away from captor's grip and use of a knife. (That is unless he was long dead after the cut in the tape.) A surgeon would very likely testify that the beheading did not cause the death. The lack of spurting blood and lack of movement suggests Berg was already dead at the time of the alleged decapitation. During the beheading, Berg's eyes are not seen. Camera angle made it impossible to see if Berg's eyes were open or glassy. Berg very probably was killed before the staged beheading. Did the captors have no stomach for the beheading of a living person? The cut on Berg's neck seems to be too straight to have been done crudely and with such speed by a man wielding a large knife. Anybody who has carved a turkey knows there is something wrong with the supposed beheading. The suspended head looks more like Berg had been neatly beheaded by a guillotine. 20) Is the person in the video Berg? "I have some more pics but the walls are the same yellow color and the baseboard is the same color as Abu Ghraib prison." 23) The videotape was quite blurred. 24) A quickly disappearing video source? A Reuters journalist in Dubai first named the Muntada al-Ansar al-Islami website as the source for the video - at www.al-ansar.biz. Although the site has now been shut down, Aljazeera.net had looked at the site within ninety minutes of the story breaking - and could find no such video footage. But Fox News, CNN and the BBC were all able to download the footage from the Arabic-only website and report the story within the hour. The video tape is obviously spliced together and heavily edited: Going from a) Berg sitting in chair talking about family, to b) Berg sitting on floor with hooded "militants" behind, to c) blurry camera movement, to d) almost motionless Berg on floor as head cut off. There is a significant time jump on tape from a datestamp in the tape of about 2:44:40 to about 13:45:47. There could have been two cameras recording this event. However, there were changes in dress after the fact that would lead to the idea of an elapsed time. Whatever the mismatch in the speaker and video (next point), videotape cognoscenti have said the scream was amateurishly dubbed into the tape. The writer of this K5 article reviewed this issue closely: The screaming starts (at 4:31 - on the copy I viewed, not the time stamp) about 5 to 6 seconds before Berg is touched (at 4:36) and he is moved to his side. He is just sitting there like a lump. While the screaming commences for (1 - 2 - 3 - 4 - 5 seconds), his head doesn't move and his mouth doesn't appear to move (though the tape is blurry), nor does he seem to be physically screaming at any time. Yet the audio plays a loud vigorous screaming. The exact same dubbed screaming continues after the long time jump and a bit of a time gap with silence and after some cutting on the head, during which Berg is not moving. This screaming seems clearly dubbed and is highly incongruous with Berg's lack of activity. "Terrorist" reader flips through pages of 'statement' at one point. He keeps ending up on the same page for awhile. As noted below, this would very likely produce a gap in speech, which is out of sync with the smooth timing of the spoken statement. Audio experts note the tape is clearly dubbed. The speaker recording is different from executioner video recording, due to lag between audio and video. "Analysis of Execution video -- I propose that the executioner's voice (according to my analysis of listening closely to the audio feed) is not that of the killer's. When listening to the executioner's voice on the tape one first notes that there is a 2-3 second lag in the "time" between audio and video, audio leading. This is consistent with the argument that the video camera and tape recorder are actually two different recording devices. What convinced me that the executioner could not be the "voice" behind the document, read prior to Nick Berg's execution, is the lack of consistency seen between the video and audio recordings, even if the 2-3 second delay is considered. A careful viewing of the video shows the executioner on "several occasions" fumbling with the 2 pages that he held, and at times reading the same page over again -- or so it appears. At least 4 times during the video the executioner is "turning over" pages, holding the pages "apart" as if confused, and all of this adds up to one conclusion. There should have been a "pause" or "2-3 second delay" in the reading of the documents during the physical handling of the documents -- but none is found that is long enough to account for it. Conclusion: The executioner is not "reading" the document. Someone else is. The executioner is trying his best to "lip sinc" the reading, but fails miserably on close inspection. The "smooth" reading of the document is entirely inconsistent (according my analysis of the video) and therefore cannot be the same person that is recording into the audio device." 30) Berg identification - why? Berg goes to great trouble to identify himself, providing information about his family. Why? To elicit greater sympathy? Or to provide a positive ID. FBI visited Berg family in an attempt to 'verify his identity'. The guy in video looks little like Berg photos provided by family. 31) Woman's scream, instead of Berg? On the first day of Nick Berg's execution, it was reported on several major news networks that al Qaeda was connected to the killer's statement, which turned out to be false. The US Intelligence translation still retains this "reference" to al Qaeda, which does not exist. The U.S. government translation of one statement made on the film is: "Does al Qaeda need any further excuses?" This is a falsification. The actual statement urged fellow insurgents to get off their hind ends and do something. One assumes the translator used by the US military is a native speaker of Arabic, so this may not be an innocent flub. Did the US government intentionally link an alleged al Qaeda group into the murder of Nick Berg? Note: the word on tape was al qaed, with quite a different meaning from al Qaeda. 33) Western body posture and mannerisms of "terrorists"
The "terrorists" have Western-style body posture and mannerisms. They seem to be at parade rest at times. 35) White hands of "terrorists"
Al-Zarqawi is/was Jordinian. Arab linguists have said the man posing as Al-Zarqawi did not speak with a Jordanian dialect. Others have suggested the man reading the written statement may not have been a native speaker of Arabic. "The guy who holds up the head at the end has a white mask and no vest. The guy who pulls out the knife and starts cutting is in a black mask. The only guy with a white mask is wearing a green vest"
Al-Zarqawi's identification by the CIA was based on "probable" voice id of the videotape. Al-Zarqawi was missing one leg. Al-Zarqawi allegedly wears a prosthetic device, according to previous CIA reports. (See: IHT Protrait of Al-Zarqawi.) There is no evidence that the killer wore a prosthetic device. Further, Al-Zarqawi had been outfitted with an artificial leg that did not fit or function properly. He was unable to walk or stand normally. No man in the group showed evidence of such infirmity. Numerous indigenous sources have said Al-Zarqawi was killed by a US helicopter attack months ago when he was unable to move quickly enough to escape the targeted house. While others managed to exit the house in time to survive, he died in the collapsed building. The man in the videotape who is purported to be Zarqawi seems to be wearing a gold ring. Note: This is a questionable point. 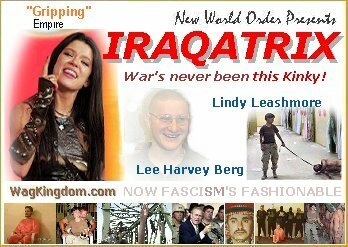 To quote Healing Iraq (healingiraq.blogspot.com) as quoted at this angryfinger.org post (Nick Berg Conspiracy Theories Abound): "Islam does not specifically forbid that men wear gold, in fact the Quran and the Hadith have encouraged men to 'adorn' and 'embellish' themselves (dying hair, perfume, etc.) .... the practice of wearing gold ornaments is discouraged by Muslim clerics, "Gold is the ornament of women". Socially it is not acceptable in the Arab world for men to wear gold, although this has changed lately and many young men do (engagement and wedding rings are mostly gold)." 44) Iraqi denial of "terrorists"
Firearms experts have stated the AK-47 carried by one man was a "Galil." This actually is an Israeli-made weapon that improves on the famous AK- 47. Feyadeen and other insurgents use AK-47s. "In the Seattle Post-Intelligencer (Seattle P-I), May 13, 2004, A4, appeared an AP article by Robert H. Reid entitled: "Questions over beheading victim's travel in Iraq." That article, which is not online, says: "Berg first worked in Iraq in December and January and returned in March. He was inspecting communications facilities, some of which were destroyed in the war or by looters. During his time in Iraq, he worked on a tower in Abu Ghraib, site of the prison where U.S. soldiers abused Iraqi inmates." Perhaps Nick saw too much when he was at the prison repairing the tower. And/or maybe that work required close collaboration with the military intelligence onsite so that he learned too much. "When Major General Geoffrey D. Miller arrived in Iraq last August with a team of military police and intelligence specialists, the group was confronted by chaos." "In one prison yard, a detainee was being held in a scorching hot shipping container as punishment, one member of the team recalled. An important communications antenna stood broken and unrepaired." 48) Work vs. no work? It has been reported all week in the media that Nick Berg was "looking for business" for his small telecommunications business. Some of his friends in Iraq who were interviewed reportedly said "business was booming." Yet others said Nick was leaving because he "couldn't find any work." It has been reported by people who knew Nick in Iraq (interviews, major networks) that strangely enough, Nick "traveled" at night. Indeed, when Nick was initially picked up by Iraqi Police (checkpoint) he was held because of "suspicious activity." 50) Berg's family was not allowed to view the body of Berg on its arrival to the U.S. It's The Same Chair!!!! OMFG!! By now, you must know the Nick Berg beheading video was some kind of fake or scam. How could you not know? The Internet is abuzz with details of a host of video anomalies. Face it. You have just been PsyOped. Brutally. Shrewdly. The Berg video was part of a PsyOp which has escalated in recent months. The aim is to traumatize you with images of brutal abuse --to foster a facsist social mindset in support of the so-called War on Terror. A faint Western voice can be heard twice in the final seconds of the infamous videotape of the beheading of Nick Berg. The voice may be saying "Thy Will Be Done." In the latest startling development, the chair in which Nick Berg was seen seated prior to his death is exactly the same type of chair in which disgraced U.S. soldier Lynndie England was seen to sit. The same chair featured in one of the infamous photos taken in Abu Ghraib prison, a researcher on the Internet has spotted. It shows Pfc. Lynndie England seated in a white plastic chair, with Army Spec. Charles A. Graner, Jr leaning over her. 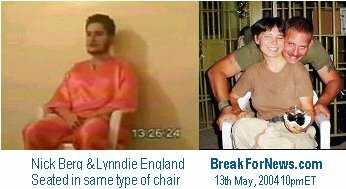 The stackable, white plastic chair which Lynndie England is using seems to be a type of chair commonly used in Abu Ghraib prison. As this second photo clearly shows. It was published yesterday in an MSNBC article on the prison. With this photo angle, you can see the chair is an open-backed style, with sloping arm supports. Just an ironic coincidence? "Her victory comes aftera well-organised and quite costly publicity campaign, which saw her touring 14 countries ahead of the contest to promote her tune." FISK: "If you are taught to despise your enemy as inhuman, you will--if you get the chance--cease to be a human yourself." "CIA did it to take the heat off the Pentagon"
One line in CBS report! "It is to protect ourselves from the kind of people that cut off Berg's head that we are in Iraq." Al Zawahiri grows new leg for video debut !